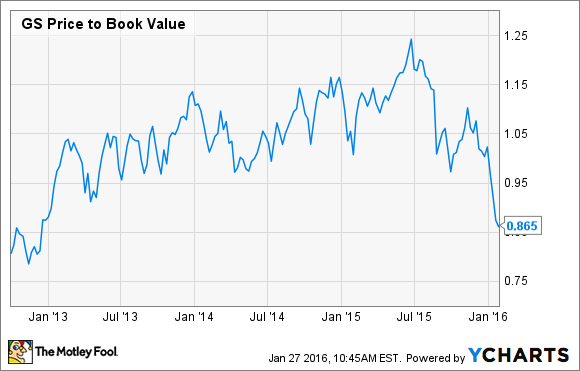 Goldman Sachs looks like a good value, but it's not without risk. Goldman Sachs (NYSE:GS) posted some pretty solid performance in 2015, with year-over-year gains in investment banking and investment management, and better-than-expected numbers on the top and bottom lines. In addition, thanks to the recent weakness in the market and the financial sector in particular, Goldman is trading for an extremely attractive discount to book value that hasn't been seen in three years. Despite all of the positive factors, the stock does have the potential to go down even more. Here are three things that could make it happen. In 2015, the IPO market was the weakest it's been in years. In fact, the $30 billion in IPO proceeds raised in 2015 was the lowest since 2009. Additionally, many of the companies that did go public in 2015 have performed terribly since. For example, handmade-goods marketplace Etsy (NASDAQ:ETSY) has fallen by more than 75% since its first trading day. Even Square (NYSE:SQ), which completed its IPO in November, is already down by more than 31% since day one. Goldman Sachs acted as lead underwriter for both Square and Etsy. The point is that weak IPO action like this tends to make companies even more reluctant to go public, which leads me to believe that 2016 could be even worse than 2015. Debt underwriting also suffers when there's economic uncertainty, as companies are less willing to take on additional leverage. As a result, Goldman Sachs might not have as many opportunities to underwrite offerings as it did last year. Overall, Goldman Sachs' underwriting revenue dropped by 11% in 2015, and I wouldn't be surprised to see it plunge further this year if conditions don't improve. The Dow Jones and S&P 500 have fallen into correction territory, but they're still a long way from being in a bear market or a crash. Still, it the market continues to fall, it could hurt Goldman's business in several ways. Most obviously, Goldman has a substantial investment portfolio of private equities, debt securities, and loans, which could take a hit if the market drops. For 2015, the investing and lending division's revenue fell by more than $1.3 billion from the previous year's -- and the market's performance wasn't that bad -- so we're not talking about small amounts here. Additionally, Goldman's investment management division has $1.25 trillion in assets under supervision, which would certainly decline if the market took a dive. Lower asset values translate into lower management fees and could even lead to assets flowing out of the company. Finally, a market crash would certainly have a negative impact on the IPO market, and I've already mentioned the potential effects. In a nutshell, a market crash could be bad for Goldman's bottom line. In 2015, Goldman's fixed-income, currency, and commodity trading revenue fell by 13%, because of low levels of client activity brought on by the challenging economic environment -- a trend seen throughout the banking industry. Lower oil prices are definitely not helping, and Goldman specifically said that its commodities trading revenue has been weak. And I think it's safe to say that the economic climate hasn't gotten any less "challenging" so far in 2016. In contrast, equities trading performed pretty well in 2015, up 16% from 2014 on higher client activity. While I don't anticipate equity trading activity to suffer in the current volatile market environment, it's certainly possible. Goldman has the largest trading market share in the industry. In 2015, debt and equities trading produced $15.15 billion in revenue for Goldman -- 45% of the company's total. So any hit to this massive revenue stream could have a big impact on the bank's bottom line. How likely are any of these scenarios? Bear in mind that these are possible reasons that Goldman Sachs stock could go down. And any one of these could certainly happen in the not-too-distant future. However, the beauty of Goldman Sachs' business is that when one division struggles, the others can pick up the slack, as you can see in the company's 2015 results. For example, an 11% decline in underwriting revenues was offset by higher financial advisory revenue. And as we mentioned already, lower fixed-income trading revenue was made up for with higher equities trading activity. The point is that it would take a perfect storm of adverse conditions, or a severe market crash, to seriously hurt Goldman's profitability. Could it happen? Sure. But I'm not convinced that it's terribly likely unless something extreme happens.